Rather than a novelist be, I will write about my family tree. After months of struggling to publish an eBook version of Pioneers of Vanderveer Park, I am happy to report that you can now download the book to your Kindle or the Kindle app on your iPad or mobile phone. For those of you who have already acquired the printed book or the PDF version, I have greatly appreciated your personal feedback, and I hope you will translate that to a positive online review. As most of you may already know, I have written this and my other books as non-profit ventures. The price charged at Kindle is the minimum price which Kindle would allow me to set. My reward is your reading and enjoying the book. Why did it take months of struggling to turn Pioneers of Vanderveer Park into an eBook? Like many first time efforts, the biggest part of getting it done was learning how to do it. Now when I create books, the process of turning them into eBooks will be relatively easy. Free download or a printed copy is available now at Lulu.com. 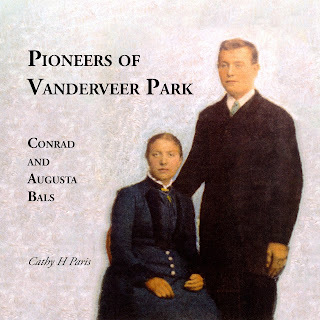 Epub version is coming soon to Amazon.com—Pioneers of Vanderveer Park. This is the true story of two people, Conrad and Augusta, who began their lives in Germany when the Civil War was raging in America and Otto von Bismarck was leading Prussia into wars with Denmark, France, and Austria. Conrad and Augusta lived the immigrants dream of finding opportunity in a foreign land and culture—pioneers. Conrad and Augusta were among the leaders in the transformation of the farmlands in the middle of Brooklyn, New York into neighborhoods filled with homes. This development, whose name and whereabouts were familiar to all who once lived in Brooklyn, is now all but forgotten—Vanderveer Park. Vanderveer Park and its sister-development, Bay View Heights, included most of the area between Cortelyou Road and Kings Highway and between Flatbush Avenue and Troy Avenue. 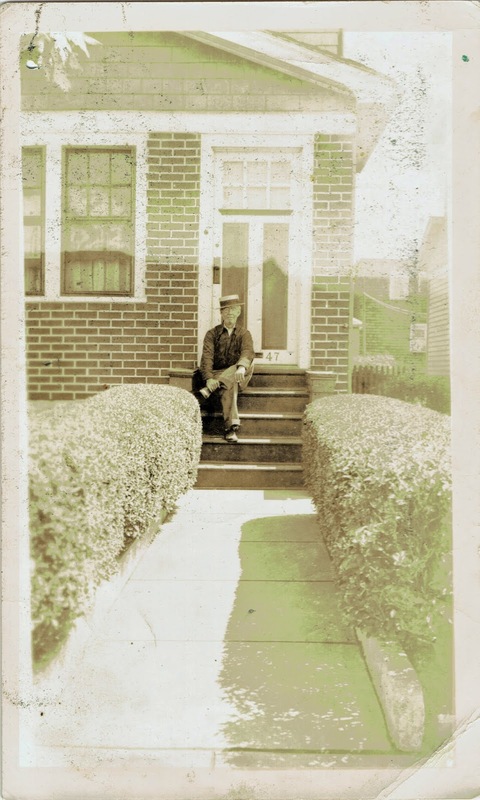 Conrad was the builder of the Cortelyou Club and many of the homes throughout this area. I hope you enjoy this epic story (400 pages), filled with old photographs and other illustrations, of a family who happens to belong to the author and may belong to you too. Pioneers of Vanderveer Park is my fifth book, but only the second shared with the public. My first book, Greek Like Me, was published in 2011. A revision to this book will be published next year. For the past eighteen years, I have been immersed in exploring our family history, and I am now focused on sharing my discoveries with others. When religious and political differences in England tore the country apart with anger and hate, twenty thousand people left England and sailed across the Atlantic Ocean to America. One of the people was my 7th Great Grandfather, Aquila Chase. Aquila was born about 1618 in England. Aquila may have been born about thirty-five miles from London in the town of Chesham. Today you could drive from Chesham to London in about an hour. There were no cars when Aquila was alive. If Aquila went to London, he walked, road a horse, or maybe took a carriage. The trip took a whole day. I don’t know if Aquila ever went to London, but I do know that Aquila and his brother, Thomas, sailed to America, arriving by 1640. When Aquila and Thomas arrived, my 10th Great Grandfather, Rev. Stephen Bachiler, was already in America. The Rev. Bachiler was a tall, thin man with white hair, very dark eyes, and a prominent nose. He was obstinate and had firm beliefs. Although he moved and spoke slowly, his voice was strong and clear. In 1638, Rev. 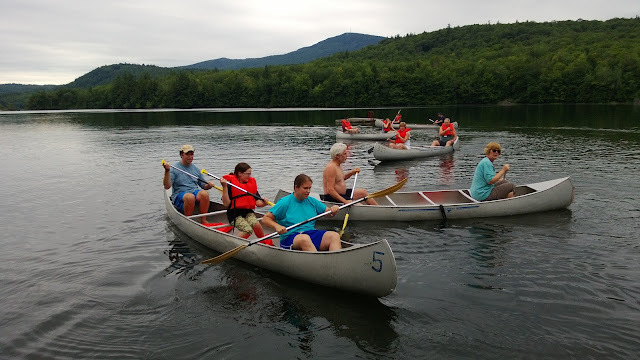 Bachiler led a group of people into the wilderness to build a new town which was named Hampton. Early the next year, Mr. Timothy Dalton, a man who later became the reverend's arch enemy, brought a new group of people to Hampton. Aquila and Thomas may have arrived in Hampton along with Mr. Dalton. In 1640, Aquila was granted six acres of land on which he was to build a log cabin and raise a family. Aquila's six acres were south of Meeting House Green and near the marshes on the road to the Tide Mill. His acreage is part of an area that later became known as the Perkins homestead. In 1640, Aquila was 22 years old and didn’t have a wife or any children. Before too long, Aquila became engaged to Anne Wheeler, the daughter of Ann (Yeoman) and John Wheeler. Soon Aquila and Anne were married, and they had children who had children who had children and so on and so forth until I came along. Aquila Chase and Anne Wheeler are my 7th Great Grandparents. Aquila was an active member of the community. On March 7, 1643/4, 29 men signed a petition for changing the law about military drills. Thomas didn't sign the petition. Aquila did sign it. A few months later, Aquila was granted six acres of upland meadow and swamp. In 1644, Anne gave birth to Sarah, their first child. On February 23, 1645/46, Aquila was granted one share of the common lands, and his brother, Thomas, was granted two shares. The common lands were in the center of town and the best place to keep the livestock. By keeping livestock close to the cabins and in a common location, the townspeople could help each other protect the cattle from wild animals and other dangers. Aquila and the other townsmen had quite a bit of land. They needed to work the land to provide for themselves and their families. There were no grocery stores. To feed themselves, they had to grow their own food, gather nuts and berries, hunt and fish, and raise livestock. People had very few tools to help them with their work and spent most of their time doing work to help put food on the table. In accordance with their interpretation of the Bible, the settlers worked very hard six days a week. On the seventh day, Sunday, they rested. On Sundays, the settlers gathered in the meeting hall to hear the preacher. Being so busy, you wouldn’t think that the people had much time to spy on each other and to quibble or get into big arguments. But history and Aquila’s story tells us otherwise. In 1640, the Rev. Bachiler was the town's preacher. While the Rev. Bachiler impressed the townspeople with the power and the sanctity of his sermons, he got into a vicious feud with the town's teacher, Timothy Dalton. The feud led to the Rev. Bachiler leaving Hampton. The Rev. Bachiler must have left a strong impression on his grandson, William Sanborn, who happens to be my 8th Great Grandfather. Nonetheless, by 1645, the Rev. Bachiler was gone from Hampton, and William continued to live there. In 1645, William Sanborn, was 24 years old and soon to be married. Aquila was 28 years old and the head of a family. One Sunday in 1645, Aquila, Anne, and Anne's brother, David, left the cabin and went to the fields to pick peas. They probably brought baby Sarah with them. William Sanborn and his friend, William Fifield saw Aquila in the field with his family picking peas. The Williams told everybody that Aquila, Anne, and David picked peas on the Sabbath. Four times a year, a court was convened in Ipswich, a town about 20 miles or a day’s journey from Hampton. The court heard and made judgement on matters that were very important to the settlers. Can you believe that Aquila’s picking peas on Sunday was a matter of great importance? On September 29, 1646, William and William told the Court that Aquila Chase, Anne Chase and David Wheeler picked peas on a Sunday. The court sent Aquila, Anne, & David a summons to come to the court on March 30, 1646/47 for picking peas. The summons was sent to Hampton. Meanwhile, the leaders of the town of Newbury, a town which was ten miles south of Hampton, made Aquila a very enticing offer. They would give Aquila land in Newbury in exchange for his serving as a mariner for the town of Newbury over the next four years. You can find the written confirmation of their offer in the records of Newbury: "Granted to Aquila Chase, Anno 1646, fower acres of land at the new towne for a house lott and six acres of upland for a planting lott, where it can be had, and six acres of marsh where it can be had, also on condition that he doe goe to sea and do service in the towne with a boate for four years." Aquila and Anne accepted the offer from the town of Newbury and moved to their new home. I am sure they were glad to say farewell to William Sanborn and William Fifield. By the time the summons from Ipswich arrived in Hampton, Aquila, Anne, and David were in Newbury. The following year, on March 28, 1647/48, the court in Ipswich brought closure to the pea-picking incident. They admonished Aquila and the others and remitted their fines. Aquila’s pea-picking incident propelled him to great river adventures and a very full life in Newbury. Aquila's land in the town of Newbury was located at the northeast corner of what is today called Federal Street and Walter Street. At some point, Aquila sold his land in town to Robert Rogers who in turn sold it to William Moody on April 4, 1659. Presumably, Aquila moved into a house on the site of the land he had for growing crops. These six acres are located on the north side of what is now called North Atkinson Street, about 500 feet from its intersection with Low Street. Presumably, Aquila lived on his farm until his death on December 27, 1670. Aquila was about 52 years old. Anne and eleven of the children were living when Aquila died. Sarah was 26 years old, and the youngest child, Moses, was 7 years old. Aquila's oldest son, Aquila, my 6th Great Grandfather, was 18 years old. Aquila probably was buried in the grave yard at Oldtown. Aquila put his mark on his will on December 10, 1670. The wording of the will demonstrates Aquila's concern for his wife, Anne, and for his children. He provided for Anne as long as she was a widow, and also provided for her in the event she married again. He provided for each of his children too: Ann, Priscilla, Thomas, Aquila, John, Daniel, Moses, Sarah, Mary, Elizabeth, and Ruth. Eighteen months after Aquila's death, Anne married Daniel Missilloway. Anne lived until April 21, 1687, fifteen years after her marriage to Daniel. She was about 66 years old. In 1846, a story was circulated and published in at least one newspaper that the descendants of Aquila, Thomas and William Chase, who had immigrated to America around 1629, were heirs to a huge fortune in England. The circulation of this story caused a flurry of genealogical research by some of the descendants of Aquila, Thomas, and William Chase. Unfortunately, the story of a huge inheritance was just a story, and there was no inheritance to be found. After the circulation of the story in the 1840s, some researchers claimed that Aquila, Thomas, and William were the children of Aquila Chaase and Martha Jelliman of Chesham, County Buck, England. This belief was proven to be unfounded by John Carroll Chase and George Walter Chamberlain in their book, Seven Generations of the descendents of Aquila and Thomas Chase, first published in 1928. Aquila and Thomas were brothers, but William appears to be part of a different family. On May 11, 1667, Aquila and Anne signed an acknowledgement that Aquila had sold all of his holdings in Hampton to his brother, Thomas Chase, with the exception of a dwelling and one and a half acres that he had sold about twenty years earlier. This acknowledgement is the record that tells us that Aquila and Thomas were brothers. Aquila and Martha Jelliman of Chesham, England had many children, but there was no record of their being the parents of our Aquila and Thomas. Because the surname of Chase is not very common in England, and because the name of Aquila is even less common, it seems likely that Aquila and Thomas are related in some way to the Chaase family of Chesham, Buck County England. Given Aquila's seafaring abilities, are Aquila and his brother Thomas the sons of Francis CHAASE? Francis CHAASE is the son of Mathew, son of John, son of Thomas CHAASE. He was baptized in Chesham, England on September 20, 1601. According to the records of the Merchant Taylor's Company of London, at the age of 16, Francis was apprenticed on December 8, 1617 for nine years to Thomas Brown, a merchant adventurer to Spain and Barbary. Could Francis have left behind a pregnant wife? Hopefully, during my lifetime I will discover the names of Aquila's parents and learn a little bit about them. Somebody else may already have discovered clues to his parentage, and I need only find a record of their research. But then again, the mystery of his parentage may still remain for somebody else to solve. Note: This story is based on information in Seven Generations of the Descendants of Aquila and Thomas Chase by John Carroll Chase, published in Derry, New Hampshire, 1928. John Carroll Chase asserts that Aquila Chase and Martha Jelliman are NOT the parents of the Aquila and Thomas Chase who came to America. Many places online still indicate that Aquila Chase and Martha Jelliman are the parents of Aquila and Thomas. What do you think? Who gets married on Halloween? Answer: Fred Merrill and Mary Fitzgerald. Amongst my collection of old photographs are pictures of my grandparents when they were in high school in Franklin, New Hampshire. Pup, officially known as Frederic Carroll Merrill, was born in Franklin on 10 December 1884, the fourth of eight children born to Gilbert Samuel Merrill, a Yankee who at the time, was a foreman at the Winnipesaukee Paper Mill, and his wife Maggie Carroll. Maggie was only 14 years old when she immigrated to Franklin in 1875. Some of Maggie’s aunts, uncles, and cousins had already arrived in Franklin. 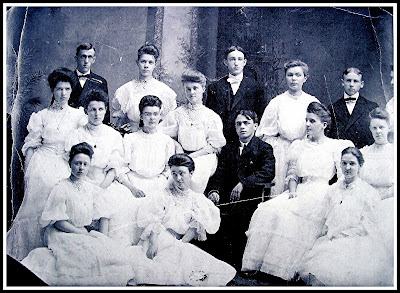 This included the Cunningham, Cushing and Sullivan families of Franklin. 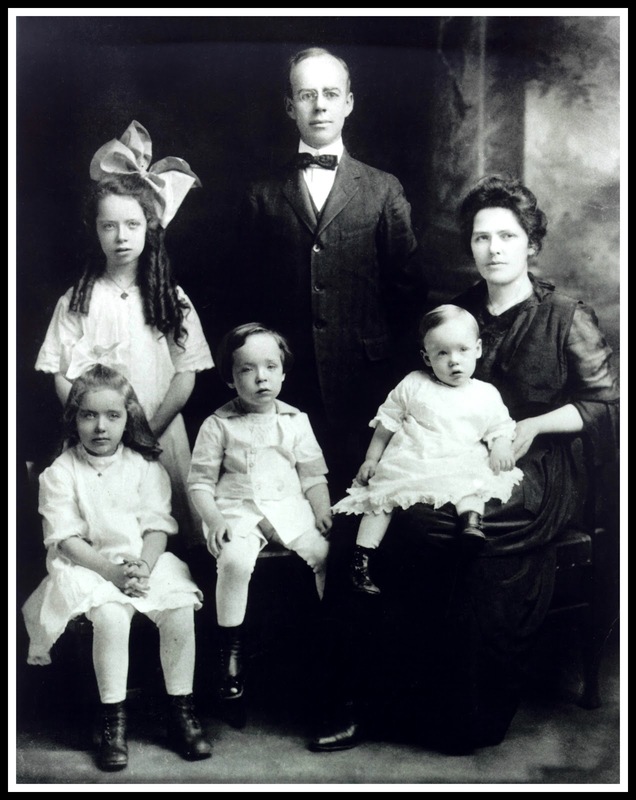 Maggie's parents and siblings started arriving in Franklin years later, but not long after Fred's birth. I am sure that they were not too happy about Maggie marrying a non-Catholic. 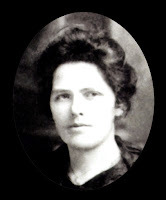 Mary Elizabeth Fitzgerald, my grandmother, was born on 20 September 1886, the second of seven children born to James E. Fitzgerald and Jenny McCormick. Jim and Jenny had a farm in Andover on the shores of Bradley Lake. [Years later, their farm morphed into Camp Marlyn, then into the Owl's Nest, and then into Bluewater Farm.] Mary worked in Franklin for the librarian in exchange for room and board, enabling her to go to high school. And there she met Fred. 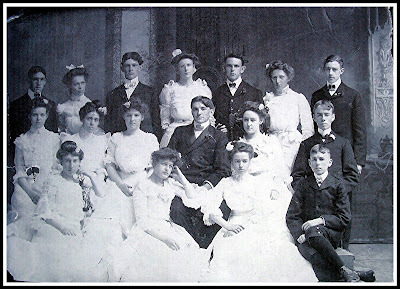 Fred and Mary became high school sweethearts, marrying on the Fitzgerald's farm on 31 October 1906. It wasn't until I was writing this post that I realized that my grandparents were married on Halloween. Who does that? "Fred Merrill of this City and Miss Mary Elizabeth Fitzgerald of Andover were united in marriage yesterday forenoon. The ceremony was performed by Reverend Fr. Lennon of Enfield and took place at the home of the bride's parents, Mr. and Mrs. James Fitzgerald. The bride was attended by Miss Mamie Lorden of Andover and the best man was Edward Clark of Franklin. About 40 relatives and friends were present including Harry E. Merrill and Charles Merrill, brothers of the groom, Mrs. Barron Shirley, Mrs. W. F. Howard Newton and Miss Aglea Vallier of this City. 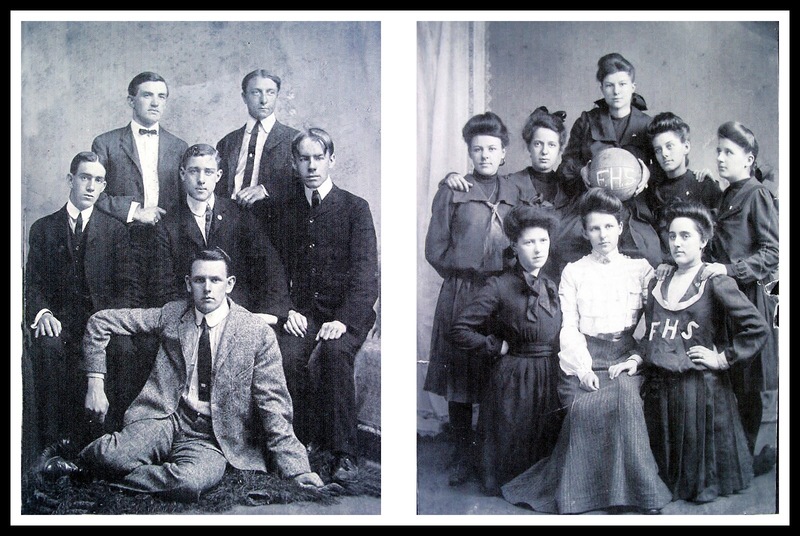 Both the bride and groom are graduates of the Franklin High School, Mr. Merrill being a member of the Class of 1902 and his bride a member of 1905. They were both active in basketball during their course, he being manager of the boys' team and Mrs. Merrill manager of the girls' team. Mr. Merrill is employed in the office of Sulloway Mills. After a wedding trip to Boston and vicinity they will reside in Franklin, making their home for the present at Mr. Merrill's parents', Mr. and Mrs. Gilbert Merrill." After their marriage, Mary and Fred lived in Franklin for nine years. They had three children, and Fred worked as a clerk. In 1915, Fred was appointed Deputy Collector for the Internal Revenue Service. The family moved to Portsmouth, New Hampshire where Fred started his new job. Their fourth and last child was born in Portsmouth. In 1918, Mary became a victim of the Spanish Influenza, whose ferocity was a hideous byproduct of World War I.
Fred relocated his family to Nashua in 1924. In 1927, he moved the family again, this time to Brooklyn, New York. Fred's zest for life died with his wife. He continued to grieve the loss of Mary until his own death in 1965.
Who knew we were canoeing on top of our families' great investment of 1866? Not me, at least not until last week. Also last week,my perception of my great-great-grandfather, James Fitzgerald, was radically changed by just a little bit of new informaton. In 2002, 2003, and 2007, I visited the offices where the property records for Merrimack County are housed in Concord, New Hampshire. During these visits, I went through all the Grantee Books and Grantor Books, looking for property records pertaining to my great-grandfather, James E. Fitzgerald, and to his father, James Fitzgerald. I had copies made of the forty three property records which I thought were relevant to their stories. These included mostly deeds and mortgages. As you can imagine, this was a fairly large stack of paper with lots of legalize. In 2007, I spent painstaking hours extracting pertinent information from all this paperwork. At the time, I discovered that I was missing the image of one of the records. In February 1866, James Fitzgerald, a tailor from Wilmot, had bought land in Andover for the first time. This was about 100 acres, more or less, for which James paid $1800. I knew that the missing deed was dated November 20, 1866. I knew that James Fitzgerald was the grantor and that a John Proctor was the grantee. For these past 8 years, I have mistakenly assumed the worst about James. In my mind, James, an Irish immigrant who had been living in America for about 16 years, had finally accumulated enough money to buy his own land. Good for James! But, James was only able to hold onto the land for 9 months. What had happened? Being a pessimist and thinking the worst, I assumed that James, who was a tailor by profession and couldn't read or write, had lost the property for failure to pay a mortgage. In my imagination, James was an Irishman who had gotten-in over his head, drank too much, and lost it all. James bought the 100 acres in 1866. This is the same year in which a John Proctor bought the land where the water flows out of Bradley Pond and where a mill or mills had been previously built and operated for a number of years. This same year, John Proctor bought some other land in the area which was adjacent to a waterway and hosted one or more mills. John Proctor bought these properties in 1866, the same year in which our James Fitzgerald bought and lost his land. To increase the power generated at the outflow of Bradley Pond, John Proctor wanted to build a dam, about 12 feet high. Building the dam would increase the potential for powering a mill or mills Unfortunately, it would also flood some of the lower lying lands at the northern end of the pond, including the homestead which James Fitzgerald had just bought. This meant that John Proctor couldn't build his dam without James' consent. He gained James' consent by buying James' newly bought farm for an undisclosed amount of monies. Why was the amount of money kept secret? I presume that James made a very tidy profit. Did James buy the property because he knew about John Proctor's plans? Did James anticipate that John Proctor would have to seek his approval in order to flood the acreage which James bought? Or was James just lucky? I had imagined that James was a failure because he had owned the land for only 9 months. Instead, this fact actually was an indicator of his success, whether by his acumen or good luck. A company making harness hames was the most successful business in Andover for many years, powered by the newly harnessed outflow from Bradley Pond. It wasn't until 1874 that my James Fitzgerald again bought land in Merrimack County. For $1400, he bought another farm, not far from his original farm. In 1884, James transferred ownership to his son, James E. Fitzgerald, planning to live on this farm the remainder of his life. Nonetheless, by 1890, James moved into a tenement in Manchester, New Hampshire. His son, James E. Fitzgerald, sold the farm and moved to Penacook and became the manager of a boarding house. 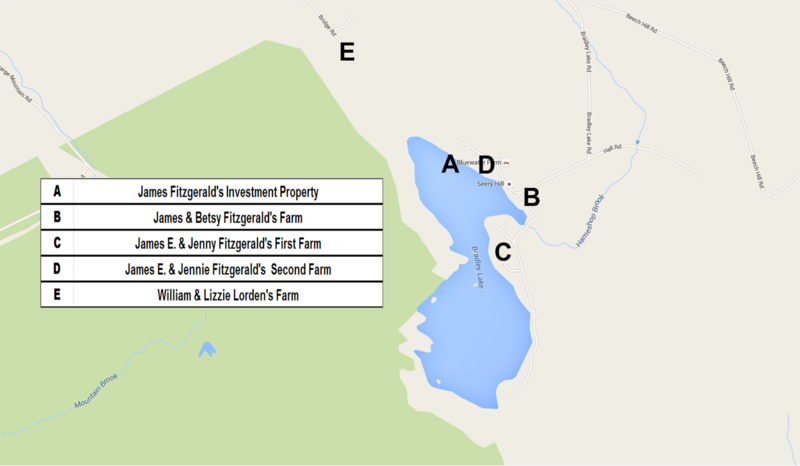 A few years later, James E. Fitzgerald exchanged properties with his sister-in-law, and again became the owner of a farm in Andover. Two years ago, we had a family reunion on the farm that James E. and Jennie Fitzgerald bought from his sister-in-law in 1893. This is the farm where my grandmother grew-up and where my Dad and his brother and sisters visited in their youth. This farm is adjacent to the farm which James E. Fitzgerald's father had given him, lying along the shores of Bradley Lake at a spot overlooking what had been his father’s fortuitous purchase of land now largely covered by water. The next time I return to New Hampshire to visit my great-grandfather's farm, I will look towards the lake and remember the old farm now covered by it's waters, and thank the powers that be for the luck of the Irish. The below map shows the relative locations of farms that my family bought in Andover. And for those that like a bit more detail, below is a synopsis of the associated real estate transactions. In 1866, James Fitzgerald bought about 100 acres for $1800 in February and sold it in November to John Proctor for an undisclosed amount, enabling the pond to be dammed. With the building of the dam, the property was covered by water. In 1874, for $1400, James & Betsy bought a farm and orchard from a widow, Flora G. Sargent. In 1884, James & Betsy Fitzgerald give their son, James E., the farm and orchard provided that he takes care of them, shares the proceeds, and lets them live there. In 1887, for $400, James & Betsy sells the farm & orchard to their son, James E.. In 1887, for $425, James E. & Jennie mortgage the farm to Henry Weymouth. The mortgage is paid in full in 1896. In 1888, for $50, James E. Fitzgerald and Henry A. Weymouth sell the orchard to Ann J. Matthews. In 1890, for $815, James E. Fitzgerald sells the farm to James Simpson. 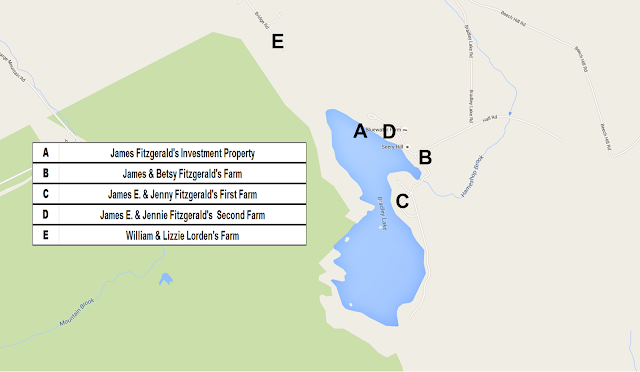 In October 1885, for $250, Jim Fitzgerald bought about 60 acres on Bradley Pond. He and Jennie sold the land for $405 in 1887 to William A. Simpson. James E. Fitzgerald held a mortgage for the property which was discharged in May 1890. In 1870, for $1300, Michael Lorden, the father of James E. Fitzgerald's best friend, William, buys about 100 acrsa in Andover from Nicholas & Catherine Wallace. In 1889, for $900, Ellen McCormick (Jennie's sister) buys the 100 + 6 acres from Michael Lorden. In 1889, for $450, Ellen McCormick mortages the farm to Michael Lorden. In 1893, for $1200, James E. Fitzgerald buys the 100 + 6 acres from Ellen. Ellen, for $1200, buys an acre in Concord, NH from James E.. In 1921, for life time support, Jennie gives the farm to her son, Maurice. A year later, Maurice returns the farm to Jennie. In 1925, for life time support, Jennie gives the farm to her son, Francis. In 1928, Francis returns the farm to Jennie. In 1928, for $1 and other valuable consideration, Jennie sells the farm to James Boyd Watson. In November 1883, about 80 acres were quitclaimed to Michael Lorden and James E. Fitzgerald for $250. They sold this land for $150 to William Lorden, Michael's son and Jim's best friend, in March 1887. We never knew our grandmother, Mary (Fitzgerald) Merrill. She was one of the victims in Portsmouth, New Hampshire of the Spanish Influenza of 1918, dying while her own children were still young. She left behind no surviving letters, at least none that I have discovered. My Dad's baby book provides the only record I have of her written words and handwriting. At the request of my cousin, Donna, I am posting Gil's Baby Book today. 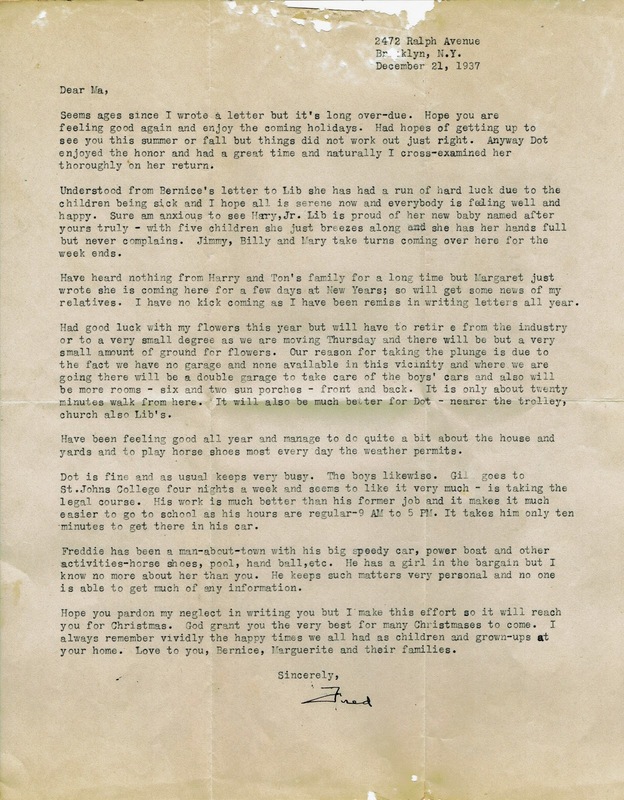 Have you found any letters written by your parents or grandparents or even by your more distant ancestors? My forebears either were not letter-writers or their letters have been lost or destroyed. Amongst my family artifacts, I have only one letter, a letter written by my grandfather to his mother in 1937. I had forgotten that I had this letter. It was sent to me by a cousin several years ago, at a time when I was busy caring for my mother or otherwise focused on enjoying our newly arrived grandchildren. The note from my cousin, with the letter, got put into a stack to deal with later. And later finally came. The past few days, I have been going through piles of miscellaneous photos and other papers, scanning them and filing them in the applicable photo album or family history binder.